“I wanted the panel to symbolise the many aspects of Virgil’s life. Virgil was a Christian Minister so the Cross is the main focus. 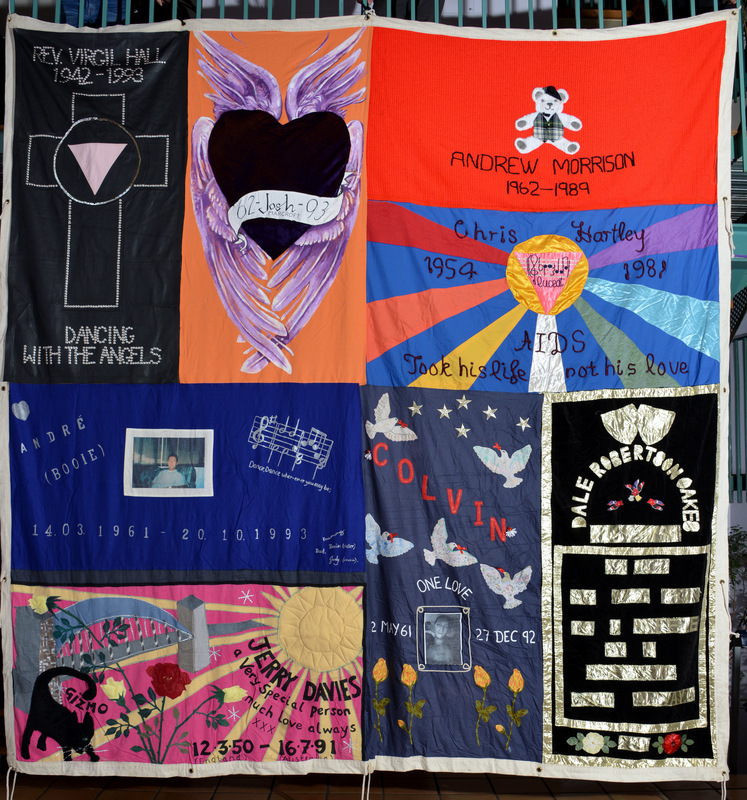 There is also a pink triangle to represent Vigil’s activism and the words ‘Dancing with Angels’ is something I found scribbled in a book in Virgil’s handwriting. 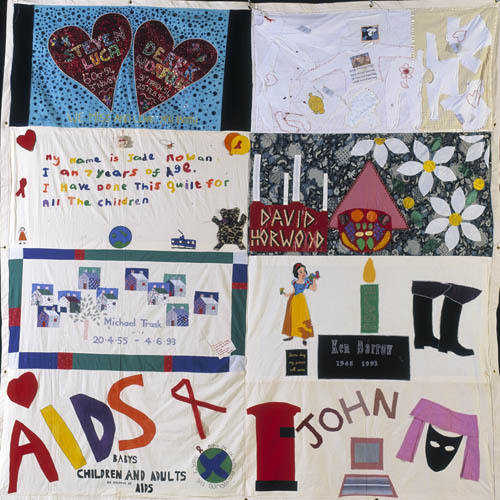 I attended the Manchester George House Trust HIV/AIDS Candlelit Vigil in 2014. Waiting for the event to begin the stage lights were so low you couldn’t see what was hanging at the back. Once the lights were up I saw the panel I had made for Virgil. It was like a bolt of lightning and he was with me once again. “Mark died on 11th February 1987 – I didn’t smile for 3 months. 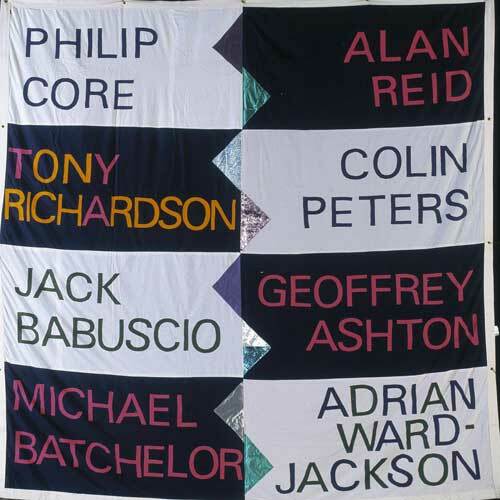 Mark, together with Mike Jackson, set up Lesbian and Gays Support the Miners that raised funds to help families affected by the miners strike in 1984/5. A fundraising concert called pits and perverts was held in December1984 and raised almost £20,000. The story was made into a film, Pride, in 2014 and gained worldwide success. 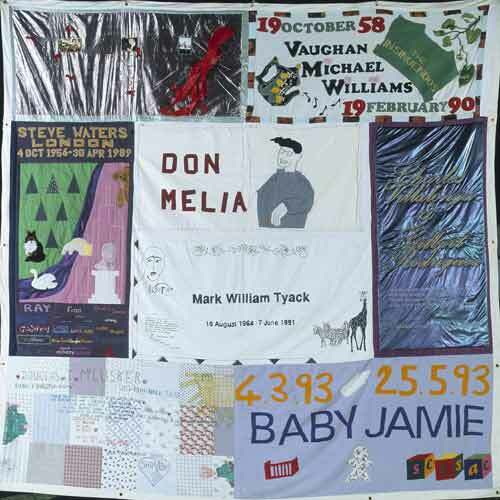 “We made Vaughan’s quilt panel at his friend Paul’s flat. 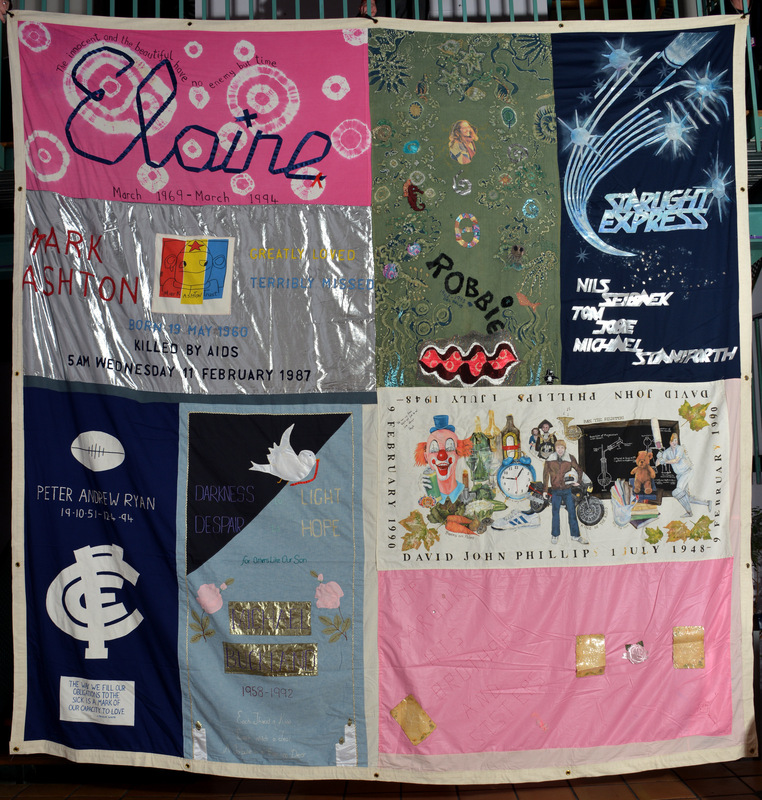 A group of us had various artefacts of Vaughan’s that represented his life and personality. I haven’t seen the panel since we made it in 1991 or 1992 so to see it again will be wonderful. Thinking about the panel recently makes me realise just how much time has passed. “My younger brother Mark was charming, charismatic and flamboyant – he died aged 26. He was diagnosed with AIDS in the late 1980’s, at the time he was in a relationship with David and they lived happily in Catford South London.